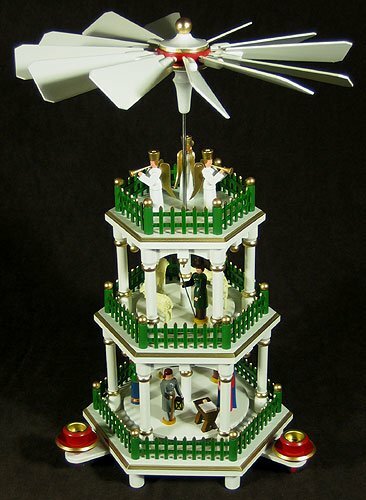 This colorful Christmas German Pyramid White Color Carousel 3 Level is petite but still has all the detail of its bigger cousins! On the lower circling tier is the Nativity with Joseph holding a lamp (the symbol of truth) and the wisemen bringing gifts to the Babe and Mary. The shepherd with his sheep are on the middle rotating level and at the top standing still are the angels with long trumpets. 3 levels with two rotating tiers. Attention to detail is what give these Erzgebirge Pyramids a lasting beauty ready to be appreciated for a very long time. Stands 14 1/8 inches tall and uses 3 medium candles. Made in Seiffen Germany. Handmade by the Artisan Coop. Your family and children will always remember the joy that German Pyramids brought to the Holidays. When they see the German Pyramid, they will remember you.